I have been forced to conclude my "eat locally" lifestyle early. As you might recall, back in the beginning of May, I started an "eat locally" week, and then kept on going with about 80% local eating of mostly organically grown local foods from a 100 miles radius from me. 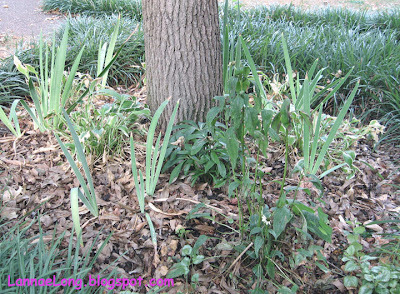 It was a slow start for me because in April we had a deep freeze of less than 20F, and all the delicate blooms had died. The 1st week of May usually is the 1st week of bounty, but this year it was pushed back 2 weeks due to the freeze. I thought we were going to have a decent rebound, but I did not think that we would have a summer of drought. Personally at my house, all the few scattered rain showers passed by my house without a drop, and it has been about 12 weeks since rain has graced my garden. 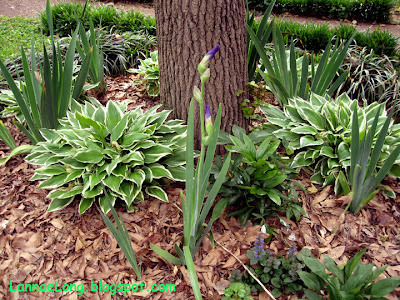 Today, we finally had rain, a nice steady rain that would allow water to soak in. Just as I was walking to my office building, the 1st drops started to fall. There is that smell that comes when the rain first starts to fall. It makes my mouth water, and I have to stand there breathing in deeply through my nose. The smell takes me back to when I was a kid living in Southern California, where it barely rains. As a kid, that smell meant rain, and all of us kids would run outside to play in the rain. We would just enjoy the rain and puddle games that would drench us. Rain was such a rare occurrence back then, and rain was always welcome. That rain smell always meant good things, and put everyone in a good mood. Since moving to Nashville, I have taken rain for granted, as we generally have more than enough, but not this year. I have no words to explain my happiness for the rain, the thoughts of trying not to take rain for granted anymore, and the bit of resentment of the drought while some parts of USA have been flooded (wiping out food crops) while we have had record heat and drought (wiping out food crops). So, I go on with my evening tonight wishing for more good soaking rain tomorrow. I want to have the first drops hit my head as I am walking to my office. I want to take a few moments to breath in that "1st rain" smell that I adore. I want lift to come back to my garden. UPDATE: Sadly, this restaurant only lasted weeks. It is closed. Two days ago, I was tipped off by stranger in an email, that there was an authentic homestyle Chinese Shanghai region restaurant in town. The cryptic email said this place was opened in the May/June time frame, the writer had eaten at the restaurant a few times since the opening, and thinks that it is authentic because of the number of Chinese people eating at the place. I do not know where I might know the stranger, but the stranger was kind enough to include a scanned menu in the email for me to study. I looked, and it is a small menu. There are dishes like Shanghai Kaufu, duck wing with brown sauce, stuffed bean curd and puff with minced pork, and potherb mustard with shredded pork. You can't get these dishes at any other mid-TN Chinese restaurants. All the other Chinese restaurants in the area are like "mall food" like that syrupy sweet General Tso's kind of places, and not real Chinese food. This Shanghai Cafe is, so far, the one and only authentic Chinese restaurant in Nashville. So tonight, we drove down to the place where I thought it was. This place is located in the old Walmart shopping center at the corner of Old Hickory and Nolensville Rd in the Tusculum coummunity of Nashville. This place is tucked back into the far corner of the strip mall, and once was home to iPoh Malaysian restaurant, and before that China Buffet. The location is a bit far from my house, so I won't be going often, but I will support this venture. The location is kind of strange now that the Walmart moved out, and it is a bit of a dead mall. There is the big giant white elephant (the empty Walmart building) and then a few restaurants around. I think this location may be a "hard sell" because it is hidden from the road, and there is no reason to go to this strip mall without an anchor store. So, we ordered two dishes off the menu, the rice cake (moochi) with pork and mushrooms, and the veggie pork fried rice. The specials board was written in Chinese, and the owner did not bother to interpret 1/2 of the Chinese menu. I wish I knew how to read the board. At anyrate, the specials were mostly veggie dishes, and I told the owner that I wanted him to make us a veggie dish, chef's choice. As the dishes came out, we were happily surprised. The moochi - rice noodle dish was the real deal. It was made with chopped pork, rehydrated dried shitake mushrooms, bamboo shoot slivers, and moochi noodles. The sauce was simple, it tasted like chicken stock and water that was thickened with a little rice flour (from the moochi) or corn starch. It was as homestyle as you can get. It was a good dish. We got the veggies next, again another simply made dish. 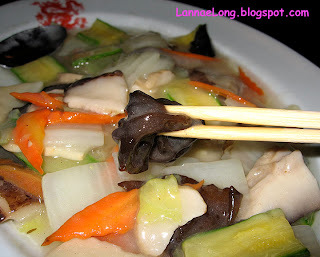 The ingredients included black fungus mushrooms that are only served in real Asian/Chinese restaurants, and I ate every single one. They have a nice salty and earthy flavor that I am happy to taste. The veggie dish also tasted like there were fresh bamboo shoots, not canned in it. That is impressive in my mind. Most every bamboo shoot served, even in Boston, San Francisco, and New York Chinatowns are the canned yellow variety, not the sort, fresh white variety. The fried rice was also getting close to what I would want in a fried rice. 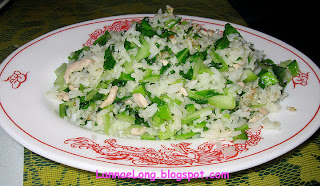 If you go to New York, Boston, Chicago, or San Francisco's Chinatowns and get stir fried noodles like Chow Fun, or any type of fried rice, there is a peanut oil smoke point flavor and aroma that adds to the dish's appeal. When the owner brought out the fried rice, it had that peanut oil smoke point aroma. I was hoping some of the rice would have some crispy burnt bits (I love that) but alas it did not. The chef put in some chopped pork and a green chopped veggie that is probably some type of Chinese broccoli, but it had almost an onion undertone to it. It too was fresh, different from the expected and tasty. I am surmising that Shanghai food is lighter and veggie based food while Szechuan, which is hot and spice. Also, as the chef is making authentic Chinese food, there was not one drop of high fructose corn syrup or sugar in the food, thank goodness. It was really good straight forward Chinese food. It is not "Americanized" food with the label "Chinese" as all the other Nashville Chinese restaurants are. 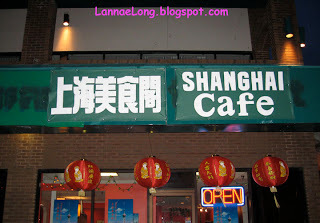 Shanghai Cafe is the real deal. As we were leaving, I spoke with Dave, the owner. He came from Shanghai 11 years ago, and has owned a couple of other restaurants in Nashville. He used to own a Chinese restaurant in the Rivergate area, Golden Garden, but sold it. The only Chinese restaurant I had been to in Rivergate was sadly that same old "Americanized mall food" like General Tso's chicken made with a high fructose corn syrup sauce. I am wondering why Dave would open such a business like this new one with authentic food. I am totally on board with this restaurant, there were a couple other Asian diners there who are totally on board, but who else? I really hope more people catch wind of this place and try some of the real Chinese food. This historic cafe was once a 14 room motel and tea room in the 1950s and 60s located on the terminus of the Natchez Trace. It must have been a site for sore eyes and butts to see a motel and diner after driving the 400+ miles of the Natchez Trace. In 1985, the motel was closed, and the business concentrated on the cafe. 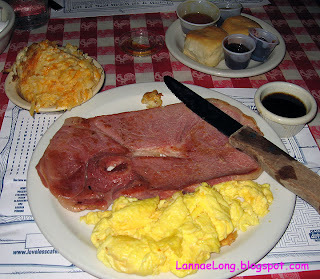 When I first got to Nashville nearly 10 years ago, I went out ot the Loveless Cafe for breakfast twice and once for dinner in that 1st year, and never went back. Back then, when I went there, the cafe was not kept up too well, it was dirty, rundown and sticky. But because it has been such an institution for Nashville breakfast seekers, it remained busy, and nearly impossible to get a seat on the weekend without a 2 hr wait. The one thing impressed me about this place 10 years ago, was the biscuits. I dislike biscuits a lot because they are usually crumbly, crumby, and plain. These biscuits were hot, flaky, and tasty with the homemade preserves. The rest of breakfast was lack-luster in my mind, so I had no burning desire to go back for breakfast. 10 years ago, I tried dinner, and the supposed famous fried chicken. That too was terrible, dried out, stringy, tasteless besides grease, and the biscuits were hard and obviously made earlier in the day. To add insult to the injured food, the waitresses were bitchy in all the worst ways. They weren't edgy like Flo from Alice, rather they were just mean ugly biddies who did not deserve my 15-20% tip. It was disaster. Now, after new owners purchased the Loveless Cafe, and fully renovated the Cafe and the 14 motel rooms, this is a fantastic kitchy destination. 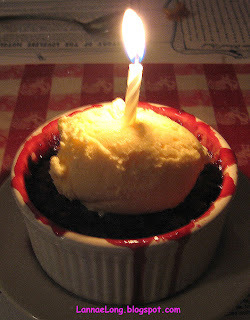 I really wanted a kitchy birthday dinner, and the Loveless Cafe kept on coming up as a suggestion. I was scared because it was so bad 10 years ago, but I decided to see what the new owners bring to the table. It was WONDERFUL! 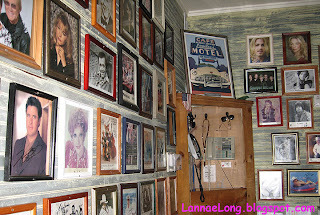 The entryway waiting area has photos of all the stars who have eaten at the Loveless. It was fun to see who ate there. There was one photo of Robert Plant that was from his recent visit to Nashville when he was working with Allison Krauss. He thought the food was EXCELLENT! The wait staff were friendly, helpful and sincere. I just could not believe how they exuded that country charm and warmth. I love them all! The breakfast food for dinner was fantastic! They serve breakfast all day long 'til 9 pm, and that is what we got. Matt got yellow eggs and ham, and I got some hickory smoked thick cut bacon, grits, mac and cheese and some eggs. I told the waitress that it was my birthday, and is it possible to comped an extra slice of bacon for my special birthday dinner. They did it! I got another piece of bacon, yummy. The mac and cheese is made in-house too, and it is made by blending American, Swiss and blue cheeses. I can say that it was possibly the best mac and cheese I have had in a country diner setting. Fantastic! The waitress came back and said that I could have a free dessert too because the Loveless Cafe does that for birthdays. What else would you get at a good country kitchen? A berry cobbler of course. Again, another terrific dish. The food was amazing! The setting was country kitchy, and the waitresses were friendly and not bitchy! It was definitely a good birthday dinner. I have fallen in love with the Loveless. The dining room was clean and inviting. The motel rooms have been renovated to be a shopping area with eclectic collections of bicycles, gifts, art and other stuff. They built a cute shop where you can buy Loveless products like their bacon, ham, country ham, jams and other goodies. They also built a big brick smoker to make pork smoked bbq over night, and have it be ready by 11 am for lunch. We had such a nice time walking around to see what we could see while we waited for our table. BRAVO new owners! 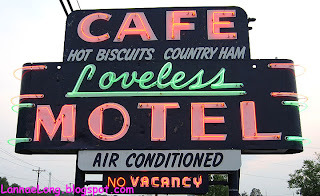 I would love to go back to the Loveless! See you soon! 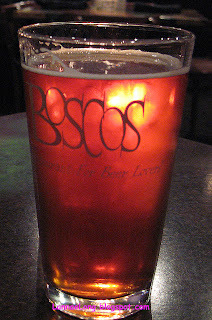 Bosco's is a brew house with a brick wood-fired oven, and an open floor plan with some brass and a lot of wood. The beer is made in house, as well as most of the food. I have to say, the food is always just much better than it needs to be. During the week, there is cask condition pouring at about 5:30-6:00 pm, to allow people to get to Bosco's after work. Some co-workers go there every Wednesday to get a glass of the cask beer or ale of the day, and socialize a bit and celebrate their friendship. These folks really enjoy themselves to taste someone else's beer, and energizes themselves to go home and make their own beer. We go to Bosco's probably the most in this town for late night dinners. 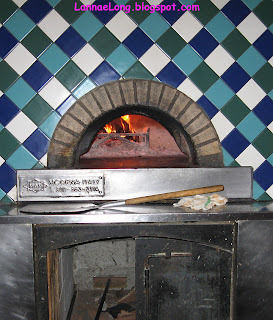 Bosco's has burgers, fries, wood oven pizzas, as well as salads, pastas, meat entrees and fish entrees. All the recipes and ingredients are so much better than typical bar food. 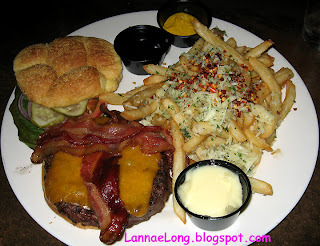 I have shown my burger, which is a great burger with really good extra sharp cheddar and applewood bacon. The fries are the garlic-parm fries that I love. The cooks know how to cook a burger, and will cook it like you want. I don't get the burger too often anymore, rather I get the pear and gorgonzola salad, or the seared tuna salad, both are very good and more than enough for dinner. There is also a really good grilled fish sandwich that I like a lot too. The pizzas are really good as wood fired oven pizzas go. They do a good job here, the crust is good, the toppings are good, and the whole package of a pizza is good. Comparing the pizzas here to the chain Bertucci's, I prefer the pizzas here. Anyway, Bosco's has become one of our default late or quick meal place. It is easy to go to, there is parking in the back, and the food is consistent. It has turned into my hometown brew pub with food that is so much better than it needs to be. So, I have finally done it. I have figured out how to marry my two loves, food and jogging. 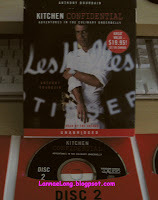 I have downloaded Kitchen Confidential, read by Anthony Bourdain, into my iPod. I have also downloaded Eat Feed, NPR Food, and the Splendid Table podcasts to my iPod. I can just jog and jog and jog, and listen to all food broadcasts and books on CD. Amazing. I have been wanting to get hot chicken ever since the 4th of July Hot Chicken Festival. It took me a month to finally get some hot chicken from the famous Prince's Hot Chicken in North Nashville. The chicken is skillet fried with a flour batter. I think this is how the colonel wanted his chicken, with a nice thick and crunch crust made from a traditional southern fried chicken method, not that dried out stuff that is now at KFC. Prince's has been around a long time, and holds a special place amongst food in Nashville. 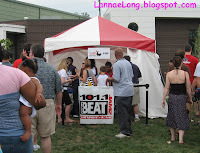 Roadfood, the Sterns, has written about, talked about, and broadcasted about Prince's. All the local newpaper food columns have written about Prince's. 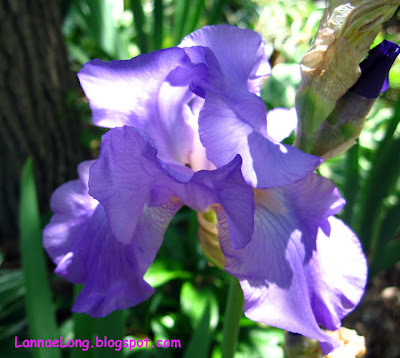 I am blogging about Prince's. It seems that Prince's Hot Chicken is synonymous with the words hot chicken. I like how it is served. The chicken is served on a slice of white bread, then a couple of pickles are toothpicked to the top. The guy packing up the chicken then puts a piece of waxed paper on top, and secures it with toothpicks to the bottom waxed paper, so it makes a little baggy that breathes, so the chicken does not become soggy when it travels to home or work to be eaten. I think the bread is about soaking up the grease and doesn't mess up y0our car or table with dripping grease. We got sides of fries and baked beans. The fries were generic krinkle cut fries, but Prince's sprinkled some of the spicy dry rub on the fries to make them tasty. The baked beans was an after though because at about 25 min into waiting I was really getting hungry. I was hoping to just have to cashier ladle out a serving of the beans (1 cup for $1.75) right there and then, and I could eat them 1st. Nope, no deal. She just added on to the order, and I continued to wait. Honestly, the beans were watery, and reminded me of a cheap generic brand of baked beans made from thinned corn syrup, and serves 6 for $0.49. It was not worth it. But then again, I was at a place with "Hot Chicken" in its name, and not baked beans. This trip, we got 1/2 of a mild-hot chicken. It wasn't that hot, and we will go medium next time. The crust was this thick crust you can only get with skillet fried chicken. The crust had a great flavor all the way through. 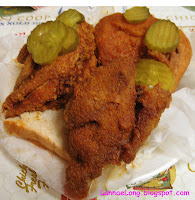 Hot Chicken is nothing like Buffalo wings, hot wings, or other any other bar food wings or chicken with a "hot" label. Hot Chicken is its own thing, and I believe Hot Chicken is unique to Nashville. Hot chicken almost defies explanation because it is unique, and those who have not had it, there is nothing similar to it. The chicken is cooked to order, so expect a wait. It takes about 45 min to get a meal. We had plenty of time to sit there, and we were lucky enough to get a seat at one of the booths. We were also lucky enough to go on a day when the AC was working in August. The previous visit, the AC was out, and it was hot like the Hot Chicken. During the wait, we observed the tablecloth for 45 min, and I decided it was appropriate to take a photo of the tablecloth. We were really lucky to get a seat because there were about 25 orders ahead of us, and many of those people were either standing, sitting in their cars, or standing outside talking on their cell phones. Before going to Prince's, I considered bringing a book or magazine because of the wait. I did not, so I ended up looking at the tablecloth during my wait. I did bring my own bottle of water and a travel mug of ice. Prince's sells sodas out of a coin-only soda machine for $1.25. I did look behind the counter and I think it is possible that Prince's may be selling Mountain Dew from behind the counter. But, for the most part, you are on your own for drinks. What spurred the month long obsession with Prince's Hot Chicken was the 4th of July Hot Chicken Festival. The 1st 400 people got free tastes of Hot Chicken from the 3 leading Hot Chicken vendors, Prince's, 400 Degrees, and Bolton's. We got a taste of each chicken, and Prince's won hands down, and 400 Degrees came in as a second. Sorry Bolton's. Bolton's is actually the closest to my house, but I just don't dig their chicken. Bolton's is more about hot fish. They have hot whiting. What is whiting fish? A week after the Hot Chicken festival, we drove up to Prince's for dinner. We found it closed for vacation for a week. Dissed I say. Then we drove to 400 Degrees, located on the other end of Trinity Lane. It was after 9 pm at this point, and 400 was closed, and they close at 7 pm! Sigh. Then I just wanted some form of fried chicken that I could toss some hot sauce on to make a weak version of hot chicken, and we drove back to the local KFC (gross I know), and it was closed before we got there. I was lucky because I do not like KFC now that it isn't really the colonel's recipe anymore, and I was spared. Happily, a month later, I was able to get a taste of the Prince's Hot Chicken. Prince's is the winner of the Hot Chicken taste test that I personally conducted at the Hot Chicken Festival. So, as I write things in this blog, I always want to come up with a witty title, or a dry-humor title that only a grandfather would kindly chuckle at. For some reason, I just could not think of a funny or dry humor title for Germantown. Is it that I think Germans are serious people, like Albert Einstein? Well, actually I heard on Science Friday that Albert Einstein actually was a humorous and a likable guy. Is it that I think Germantown is serious? Well, not totally serious because it has a rather fun October Festival with lots o' beer, polka bands, and brauts and kraut. At anyrate, my title is straight up Germantown Cafe. Germantown Cafe is in a part of town called Germantown. Germantown Cafe doesn't sell anything that is German per se, rather it is a new American restaurant. There is a smart wine list that pairs with the entrees, and the waitstaff seems to know the recommended pairings. We go there every so often, and they serve a salad with every entree. The salads are great because they are lightly tossed with dressing, so it is like a refreshing salad, not a salad drowning in dressing. Ok, so one of my pet peeves is a salad with a big glob of dressing on it, and not tossed. For most restaurants, I ask for dressing on the side, so I don't get the big glob. Germantown is one of the few restaurants that I will allow the kitchen to dress my salad for me because they do it right. 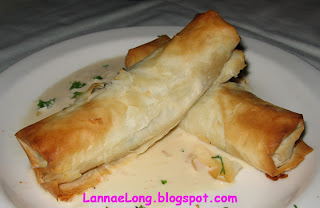 On this trip, I decided to start my dinner with the cheese strudel. It appears that the strudel of the day is whatever the chef feels like making that day. It seems like the construction was cheese rolled in phyllo dough and rolled over like a burrito, then baked in the oven. These were simple, straight forward and tasty. 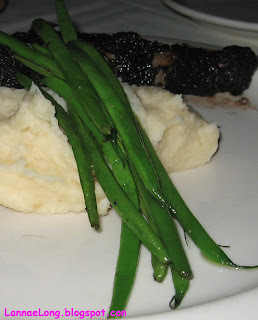 For the entrees, we opted for beef charred Pittsburgh style on top of mashed potatoes and tiny green beans, and the special rack of lamb with asparagus and sweet potato casserole. Germantown seems to have "one of each" menu, that is one of each, chicken, fish, pasta, veggie, beef, pork and lamb. Apparently I am in a rut, and I always get the lamb. I got the special pasta dish once, made with pistachios and olive oil, but then I got jealous when I watched the lamb dish get placed on another diner's table. I wish I could tell you about the beef dish, but it was eaten all up by my dinner mate. The one thing I do know about the tiny green beans is that Germantown Cafe often serves tiny green beans, and that makes me laugh because they are so tiny cute. My lamb dish was the whole rack of lamb, 8 ribs that were cut into 4 double lamb ribs. Germantown frenched my lamb (No, don't think lovers lane "frenched". I can't believe you thought of that and not the culinary term to scrap, clean and trim the rack of lamb bones), so I could have cut the individual ribs and eaten them like lollipops. I ended up eating only 1/2 of my meal because it was so rich and filling. I took the rest home. We opted to bring our own wine for a corkage fee, and we brought a 2002 Matanzas Creek Cab. 2007 is the perfect year for the Matanzas Creek cab, and I think it went really well with both of our meals. But then again, what do I know about wine? Not much, but I do know that this one stood up to a lamb meal. We only have one more bottle of the 2002, and we need to drink it soon, it is so good! Anyway, back to the food. The next day, I re-heated the 2nd 1/2 of my meal in the oven because oven heat is just tastier than microwave heating. It was one of the most luxurious leftovers lunch I have ever had.